Swiss chard seedlings say: "Hi, hi!" Swiss chard (a beet without the beet), however, is well-revered on deck and well-received below deck. The tasty greens flourish along red and white (and sometimes orange, yellow, and pink) stalks and can stand in for spinach in just about any recipe. Planted on April 20, these red Charolette (POD was unable to resist a chard named Charolette) and white Erbette seeds sprouted less than a week later. Both are touted as heat resistant and are likely to last through most of the summer. 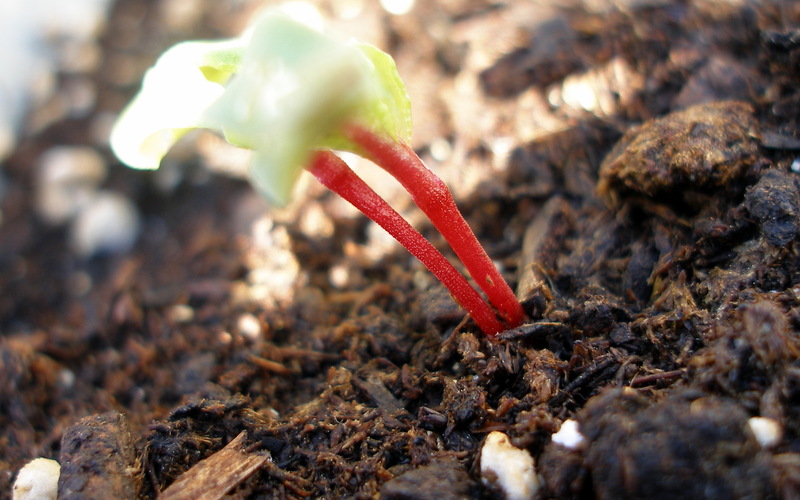 Like just about anything planted in a container, chard prefers a soil that’s rich in organic matter and a regular feeding schedule. They’re a lot less picky than other veggies, though, and can probably tolerate last year’s (sterilized) and re-enriched soil. A few tablespoons of coffee grounds were mixed in for a little extra nitrogen kick. Well-watered soil is absolutely key for keeping chard from becoming too bitter during the hot summer months. It can tolerate partial shade, which is great, because POD sun allotment can be rather erratic. Don’t be surprised if more than one delicious sprout emerges from the ground: each seed pod may contain multiple seeds. Here’s where it gets tricky: who likes thinning plants? It’s murder, right?! Fortunately, chard is pretty hardy so many duplicates were carefully pinched from the soil and replanted elsewhere (alongside the cucumbers, for example). Chard doesn’t mind a little crowding (which makes it an excellent container vegetable) but somehow you’ll have to bring yourself to thin to 3-4″ between plants. Since you can harvest chard at any point, POD plans on yanking several out, roots and all, when they’re at the leaf lettuce stage. They’ll taste great in a salad and this should leave plenty of room for the remaining plants to produce larger, more traditionally-sized stalks. Then, simply harvest the outer stalks as necessary, allowing the inner shoots to grow rapidly to maturity.